Plans for a new Columbus Crew SC stadium were unveiled Thursday, showing a new venue surrounded by mixed-use development in Columbus’ Arena District. The long-term status of the Crew has been in flux, as club investor-operator Anthony Precourt was making efforts to move the team from Columbus to Austin until it was announced earlier this fall that discussions were taking place about keeping it in Ohio. In that scenario, a group led by Jimmy and Dee Haslam–owners of the NFL’s Cleveland Browns–and the Columbus-based Edwards family would buy into MLS and receive operating rights to Columbus. Meanwhile, Precourt would remain a MLS investor, allowing him to move forward with plans for a new Austin stadium no later than the 2021 season. (Remember: MLS is a membership league, not a franchise league). The Haslam-Edwards group would need to move forward with that transaction in order for the proposed $230 million stadium in Columbus to become a reality, but plans revealed Thursday provided a glimpse of the long-term vision for the Crew. A replacement for the club’s MAPFRE Stadium would be constructed on land west of Huntington Park, the home of baseball’s Clippers (Class AAA; International League). The 20,000-seat soccer-specific stadium would be surrounded by a development known as Confluence Village, featuring a slate of amenities that includes 270,000 square feet of office and commercial space as well as 885 residential units. The rest of the proposed Confluence Village site is owned by Nationwide Realty Investors, the real estate arm of Nationwide Insurance, which purchased 13 parcels from casino developers Columbus Gaming Ventures in 2011 for $11 million. Officials don’t yet control any of the Nationwide land needed for the project. Alex Fischer, president and chief executive officer of the Columbus Partnership, which has been deeply involved in the project, said discussions about the site are “real serious,” and hinge on which parties would develop which pieces of the land. Officials started lifting the veil on the plan Wednesday when they announced that the Crew would remain in Columbus and continue to use Mapfre Stadium for two more years before moving to a new stadium as part of a new ownership plan for the professional soccer franchise. The entire deal must be completed by the end of the year to meet an MLS deadline, so that the Crew and the league can plan for next season, which begins with training in February, Fischer said. Whether this leads to a realized stadium plan remains to be seen, but the latest concept does reflect some MLS trends. The Crew would build a soccer-specific stadium surrounded by new development, which could tie into the slate of amenities that are already featured in the Arena District–a part of Columbus that includes Huntington Park and Nationwide Arena, the home of the NHL’s Blue Jackets. It would also provide a long-term replacement for MAPFRE Stadium, a facility at the Ohio State Fairgrounds that opened in 1999 as something of a standard bearer in the model of soccer-specific MLS stadiums but has since been outpaced by newer facilities in the league. 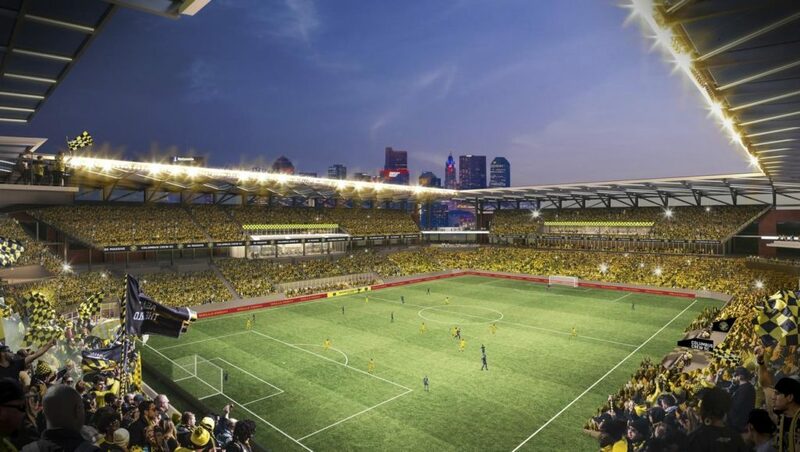 Plans for a Crew stadium were the second facilities concept to emerge from Columbus this week. On Wednesday, officials unveiled a redevelopment proposal for the MAPFRE Stadium site that calls for a Community Sports Park with community and tournament fields, as well as training space for the Crew. Work on that project would begin after the Crew move into a new stadium.